When the food editor of the Associated Press writes a cookbook, you know it’s got to be all about getting food on the table fast. After all, J.M. Hirsch’s job at the wire service is all about disseminating information timely and quickly. His new book, “High Flavor, Low Labor” (Ballentine Books) features nearly 150 recipes designed for busy, working families who want to put creative dishes on the table, but don’t want to be slaving over a hot stove for hours to do it. His “Lemon Grass and White Bean Turkey Chili” is an example of that. 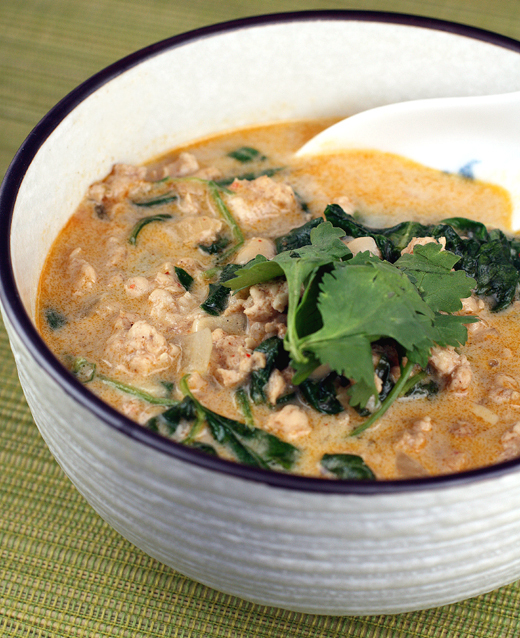 It’s sort of a cross between the classic Thai soup, tom kha gai, and American white chili. Made with ground turkey, coconut milk and jalapenos, it takes only about half an hour to make. Since lemon grass isn’t always available at every corner store, I’ve taken to keeping a few stalks growing at all times in my back yard. That way, I always have a supply when I need it. The next time you spy lemon grass at your Asian market, buy a few extra to plant. Remove any dry exterior layers, then stick the stalks in a glass of water for a week or so, until roots begin to emerge. Then, plant the stalks in a container or in your backyard, and water regularly. When you need it, you can either dig up the entire stalk to use or just cut off the stalks at the base, leaving the rest in the soil to continue growing. The recipe calls for jarred jalapeno pepper slices. Not wanting to buy a jar just for that one purpose, I substituted fresh, diced jalapeno, along with some fresh lime juice instead, which worked out quite well. Although the recipe instructs you to next add the coconut milk, chicken broth, ground turkey and drained cannellini beans all at once to the pot, I opted to add the ground turkey first and let that cook until it crumbled. Otherwise, I feared the big mound of raw turkey meat would be too difficult to break into smaller pieces once all the other ingredients were added. After adding everything else, let the mixture simmer for 20 minutes. Just before serving, add a hefty amount of baby spinach leaves and cook just until wilted. This Asian-take on white chili is at once hearty, creamy, a little spicy and a little tangy. For a dish that came together in about half an hour, it tasted far more complex than anticipated. Just like an article done in the heat of deadline, this is one dish that definitely hits the spot fast. In a large saucepan or medium Dutch oven over medium-high heat, combine the lemon grass, olive oil, jalapenos, onion, garlic, chili powder, cumin, cinnamon, and smoked paprika. Saute for 3 minutes. Add the coconut milk, broth, turkey, and beans. Bring to a simmer, then cover, reduce heat to low, and cook for 20 minutes. Discard the lemon grass. Add the spinach and stir for 1 minute, or until it wilts. Season with salt and pepper. Sounds like a great book, thanks for telling us about it. The chili is a really unique (and delicious-sounding!) idea! That dish looks yummy and the book sounds great! Ha! High flavor and low labor is my kind of cooking too! And this dish looks very appetizing. Can imagine me having them with a big bowl of steamed rice! Lemongrass and white bean chili sounds very intriguing. I’m going to have to check this one out. love the tip on growing lemongrass – I am gonna try it! Carolyn, THANK YOU for the lemon grass tutorial! On occasion I have resorted to that stuff that comes in a tube and it definitely did not measure up. This will be not only a back-yard project for me ASAP, but a potentially great gift for my hard-to-buy-for foodie son! This sounds perfect for a cold weather meal…if we ever get any cold weather around here!